I'm super happy because now I can share outdoors activities with my kids that they seem to enjoy so much, specially when it comes to biking. 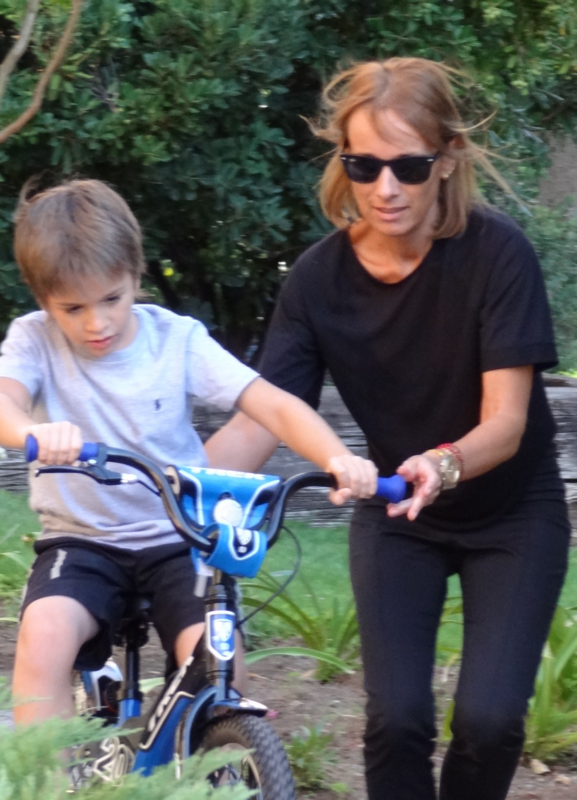 Estoy super contenta porque ahora podemos compartir las actividades al aire libre que mis chicos disfrutan tanto, especialmente si se trata de andar en bicicleta. 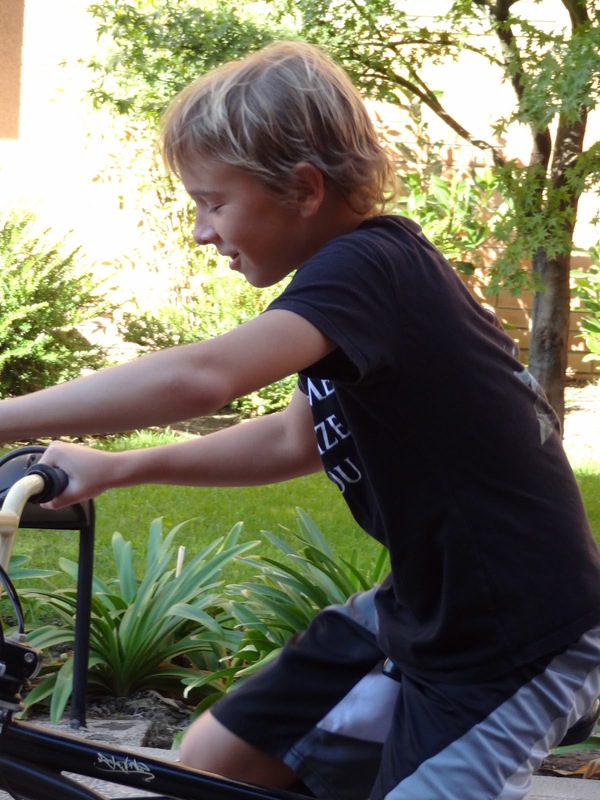 And this Saturday Luka faced a major challenge riding his bicycle without those small training wheels for the first time. Fortunately, his dad, brother and me were there to support him (or catch him!) so it all turned out okay. Y este sábado Luka enfrentó un gran desafío montando su bicicleta sin ruedas de entrenamiento por primera vez. Afortunadamente, su papá, su hermano y yo estuvimos ahí para apoyarlo (o atraparlo!) así que todo resultó perfecto. Going for a walk around the neighborhood or riding the bike on the beach are one of the things that I most look forward for the warm afternoons next month. Salir a caminar por el barrio o andar en bicicleta por la playa durante las tardes cálidas son algunas de las cosas que espero con más ilusión para mes que viene. ¿Tienes planes para el próximo mes? PS: Of course if you want another weekend story, then check here o here. PD: Claro si quieres otra historia de fin de semana, entonces chequea aquí o aquí. You have a beautiful family, !nes! La verdad es que da penita que se acabe ya el verano y las vaciones con el, pero ya apetece taparse más! A mi ya me apetece atobardarme con la ropa de primavera-invierno! jeje! Uno se cansa, verdad? You are so right :) I feel blessed. I love Lika's face in that first picture...so thoroughly! Look at you guys! Such a gorgeous family and your hair looks fine!.. don't worry about it! 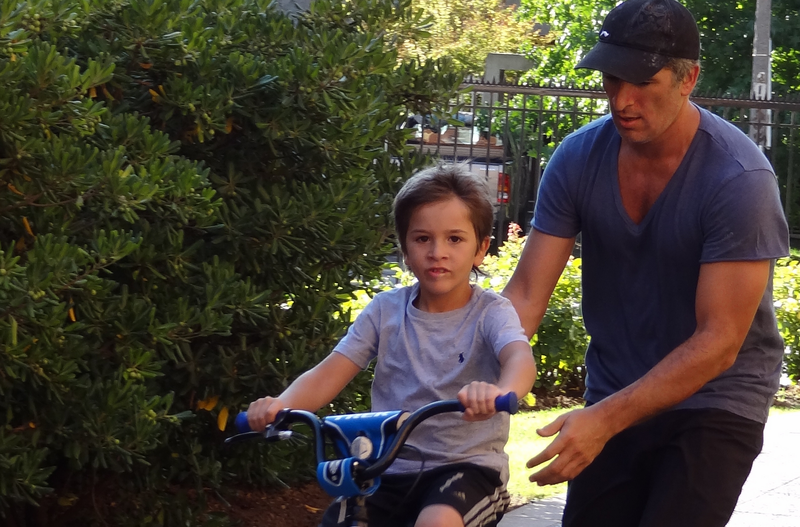 I remember when my kids were learning to ride bikes, it really does seem like just yesterday. What a special moment for all! Wonderful quote .. yes! balance in life is so important. Oh darling! I'm so with you! Nothing beats posts like this one....its so refreshing to the mind & soul! Such an adorable family!! Aww..thanks, Rebecca:) I truly ADORE them...I'm such a happy mom. Thanks, Arden :)I'll do it! It was to me! hehe! Nah! We had the best time! Me ha encantado vuestro plan de finde,y qué nenes tan bonitos tienes,y tu forma de escribir me encanta también!!! Muchas gracias por tu comentario tan amable,y por seguirme,ya te sigo en Bloglovin,tienes GFC? lovely post with very cute photos! Debe ser lindo pasear en bici bajo el sol. Uh-oh, that means autumn is on it's way here (and I'm not ready to say goodbye to summer yet)! You have such a beautiful family! I remember the day that my training wheels came off, I face planted straight into the tar, it's no wonder I ever got on a bike again! Congrats to the little one for getting through this milestone! Always a little scary when those little wheels come off! Cute photos. I've just been reading the Einstein quote in a book I'm reading at the moment! U must be springing with joy from the way u wrote. Glad you had a great outdoor time with ur family. Weather's looking really good! Wow...this is such an amazing milestone on your boy's life...This post brought me back almost 30 years! Love all the pics and what they represent! U look awesome! :D Besos! They all are perfect, you're a lucky lady. By the way, I adore the name Luka! Hope your family will be as happy forever.